The graviola or soursop fruit is native to South America and it has been growing in popularity around the world, mainly due to its sweet taste and wide range of health benefits. Graviola (Annona muricata), also known as soursop, guanabana, guyabano, and annona fruit, has been an important part of the diet and medicinal practices of South and Central America indigenous inhabitants for centuries; however, most people around the world remain unaware of graviola fruit's immense potential for nutrition and overall health. Lowering blood sugar. One of graviola's main medicinal benefits is that it can lower blood sugar levels, which can be beneficial for anyone who suffers from diabetes or high blood sugar level. Improving immunity. 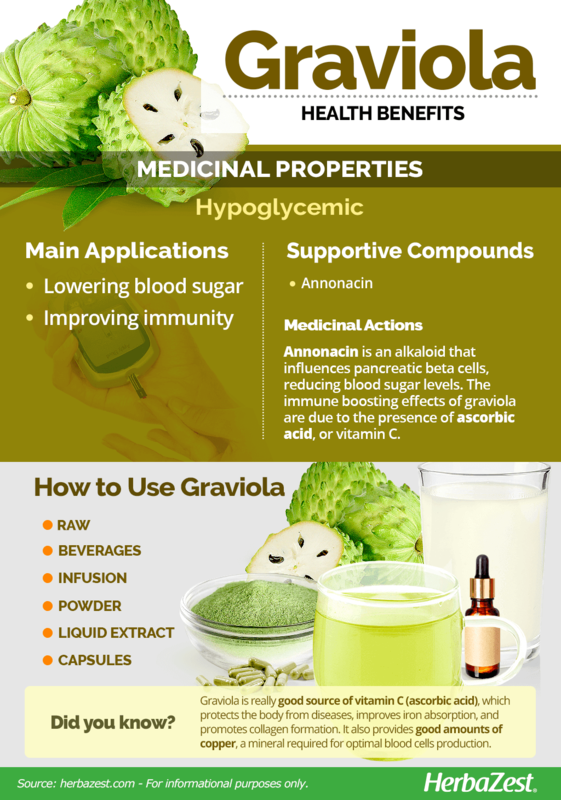 Graviola exhibits antioxidant properties. It has the ability to kill the free radicals that attack healthy cells, thus strengthening the immune system and preventing diseases. Treating arthritis. It is thought that, when applied to the skin, graviola can relieve arthritis pain. Relieving skin inflammation. People sometimes apply graviola to the skin to reduce inflammation and other skin complaints. Additionally, some studies suggest that graviola benefits may include antiparasitic effects. 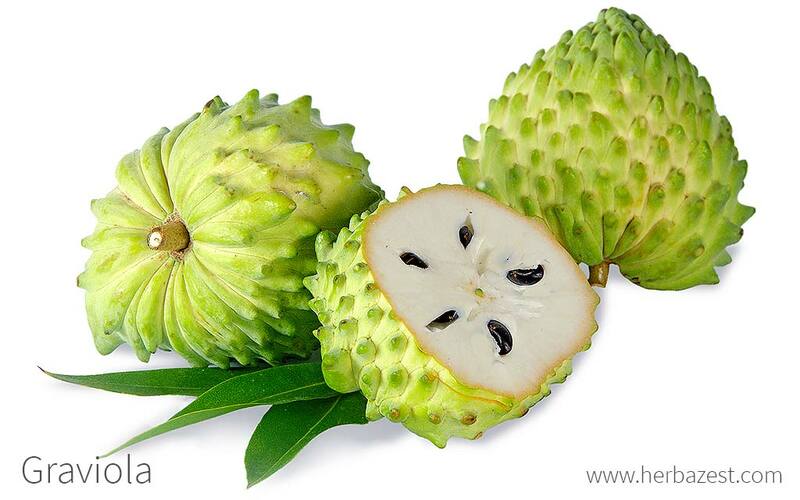 In fact, the annona fruit has been used for centuries to eliminate worms. The main reasons for graviola's varied medicinal properties are annonacin - an alkaloid that can only be found in fruits of the Annona genus - and its high nutritional value. 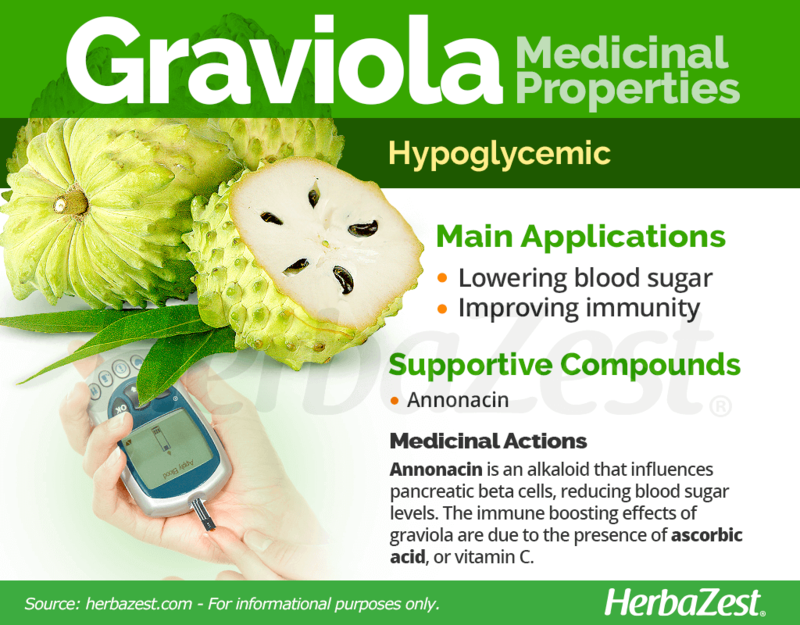 Graviola's biological compounds influence the pancreatic beta cells, reducing blood sugar levels in the body, which is beneficial for anyone who suffers from diabetes or other blood sugar level disorders. Although further studies are necessary to confirm the popular claim of graviola acting as a pain killer, annonacin has shown analgesic and anti-inflammatory potential at the appropriate dosage, helping relieve muscle and joint pain. In addition, while their exact mechanism of action is yet to be understood, the antiparasitic compounds of graviola seem to contribute to the overall health of the immune system. The vitamin content of graviola can improve the resistance of the immune system, helping the body fight disease. Herbs that also possess hypoglycemic properties are cinnamon, lucuma, and yacon. 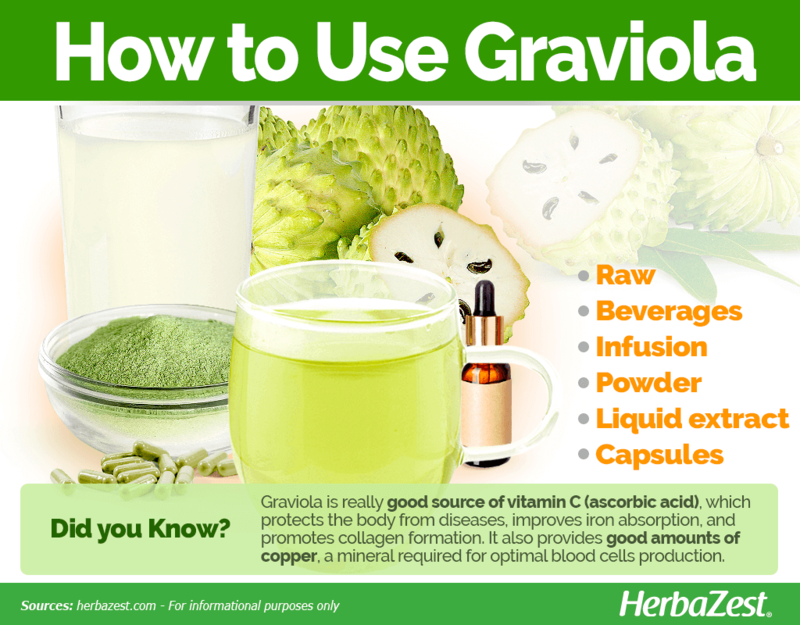 Graviola is generally safe for most people. However, when consumed in excess it can affect brain and nerve cells throughout the body, causing paralysis. Due to its high annonacin content, people with Parkinson's disease should not consume graviola, and women who are pregnant or breastfeeding are advised to consult with a physician before taking this herb in any form. The graviola, or soursop fruit, is a really good source of vitamin C (ascorbic acid), which is necessary for many bodily functions, mainly for boosting the immune system, as well as for improving iron absorption and aiding collagen formation. The fruit of Annona muricata also provides good amounts of copper, a mineral that plays a key role in the production of new red blood cells. Additionally, graviola fruit offers adequate amounts of potassium, important for the well-functioning of nerves and muscles, and magnesium, which is necessary for energy production and blood pressure regulation. It also contains fair quantities of B complex vitamins, mainly B1 (thiamin), B3 (niacin), and B5 (pantothenic acid). The nutritional value of graviola is rounded by small amounts of other vitamins and minerals, such as B2 (riboflavin), B6 (pyridoxine), B9 (folate), and iron. 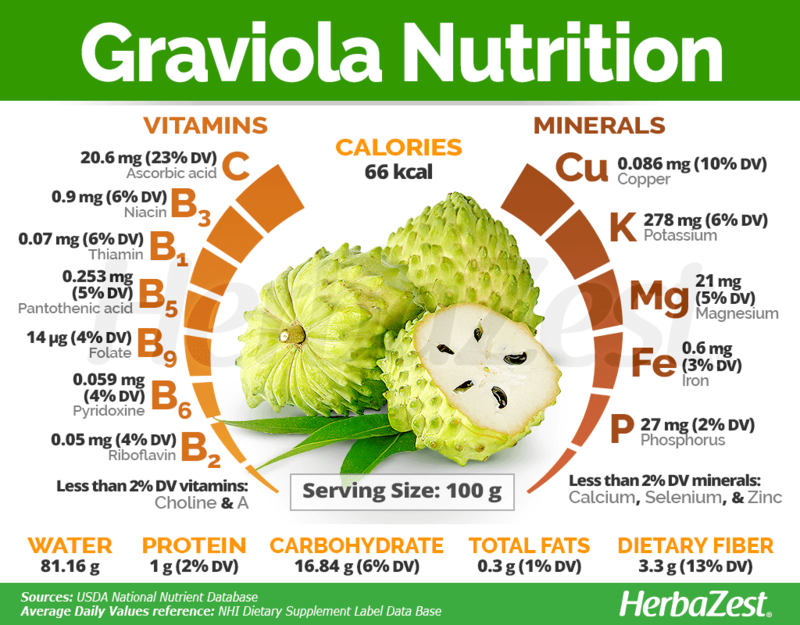 100 grams of graviola fruit provide 66 calories, about 17 grams of carbohydrates, and 13% of the suggested daily value for dietary fiber. In moderation, graviola in its medicinal forms can provide numerous health benefits. However, eating this fruit raw is recommended in order to obtain its nutrients. Raw. Perhaps the most popular form of medicinal consumption, raw graviola provides great nutritional content, and also contributes to lower blood sugar. Beverages. Another way of reaping the medicinal and nutritional benefits of graviola is drinking it in juices, shakes, and smoothies. Infusion. Another popular medicinal form, a hot graviola tea can gently contribute to lower blood sugar levels. Powder. Typically added to smoothies or shakes, graviola powder is commonly used as a nutritional supplement and it may also help relieve muscle and joint pain. Liquid extracts. When used topically, graviola extract it is thought to reduce skin inflammation. Capsules. In this concentrated form, which comes in fixed doses, graviola can help lower blood sugar levels. Graviola can be found at food markets throughout much of the tropical world. The fruit is most often sold whole, but it is easy to find juices and smoothies made of graviola in many places. Dried graviola can also be found in bulk and teabags in specialized health stores and online retailers. Graviola remedies and supplements are mainly found in specialized health stores and through online retailers. Each brand may come with different concentrations and natural supplements like graviola are not regulated, so it is important to be cautious. It is recommended to seek medical advice in case of any preexisting health condition or possible interactions with prescribed medications. GRAVIOLA TEABAGS ARE POPULAR AND CAN BE PURCHASED THROUGH A NUMBER OF ONLINE RETAILERS. Because it is native to tropical climates, the graviola tree thrives best in humid regions with damp, loamy soil. Also, because it is a low-growing, bushy tree that can reach heights of 25 - 30 feet (7.5 - 9 m), it is important to plan accordingly where to plant it. Follow these additional growing guidelines to successfully cultivate graviola. Growing a graviola tree from seed is recommended, rather than buying a plant from a nursery. Hard seeds, rounded or oval, usually must go through a process of scarification, which can be done in two ways: lightly sanding the surface to facilitate germination, or subjecting them to a thermal shock, which can be from cold to heat (at least 24 hours in the refrigerator), or from heat to cold (one second in boiling water and 24 hours in water at room temperature). It is important to scarify seeds and sow them in grounds of about one inch (2.5 cm) of damp soil that has been mixed with organic matter. Depending on temperature and water drainage, germination can take anywhere between 14 and 30 days. Be sure to give this plant full sun exposure. The graviola tree is highly intolerant of cold weather. Temperatures below 5 °C (41 °F) will cause damage to leaves and small branches, and temperatures below 3 °C (37 °F) can kill it. For this reason, be sure to keep it in a hot climate, whether that is outdoors or in a temperature-controlled greenhouse. Each crop yields 12 to 24 fruits per tree during a harvest. Seeds are typically set out in the beginning of the rainy season, due to its need for moisture and should be spaced at least 12 - 15 feet (4 - 5 m) apart, but can be spaced up to 25 feet (8 m) apart. The graviola tree begins to bear fruit three to five years after it is first planted. Graviola trees are vulnerable to mealybugs and fruit flies. Also known as guanabana, guyabo, and soursop, the graviola fruit has an incredibly distinctive heart-shaped appearance with a spikey exterior. The graviola tree's malodorous, evergreen leaves are smooth, glossy, and dark on the upper surface while they are lighter underneath. The flowers can appear anywhere on the graviola tree - the branches, twigs, or trunk - and typically have yellow-green outer petals with pale yellow inner petals. Graviola (Annona muricata) is a member of the Annonaceae family, also known as the "custard apple tree family," which comprises approximately 130 genera and over 2,300 - 2,500 species, including ylang ylang (Cananga odorata), pawpaw (Asimina triloba), and cherimoya (Annona cherimola). Members of this family are mostly found in the tropics, though some do enjoy more moderate temperatures. For example, the closely related Annona cherimola has proven to have a greater adaptability to temperate and Mediterranean climates, which is proving useful for its related industries. Of the different varieties and subspecies of soursops, they are divided into three main classifications, which are based on flavor (sweet, subacid, and acid), shape (round, heart-shaped, oblong, or angular), and flesh consistency, which varies from soft and juicy to firm and dry. All of these different varieties of graviola serve different purposes, depending on the region they are grown in. Some of the most popular varieties have Spanish names, including guanaba azucaron (sweet), which is either consumed raw or used for drinks, and guanaba acida (very sour), which is used only for flavoring drinks. Other popular varieties include guanabana dulce (sweet soursop), and guanabana sin fibra (fiberless). Graviola was first used by the indigenous people of the Peruvian Andes as a fruit crop and as medicine. In Peru, the plant leaves have been used as a sedative, whereas those in the Brazilian Amazon used it to treat liver problems and increase milk production in breast feeding women. In pre-colonial Jamaica and Haiti, the graviola fruit has also been used for treating diarrhea. From there, graviola began spreading throughout Europe and the rest of the world. The famous American author Mark Twain referred to graviola as "the most delicious fruit known to man," and the fruit was profusely represented in the form of ceramics and textiles by the ancient cultures of South America. The graviola tree is grown extensively for the commercial value of its fruit. It is still predominately cultivated in its native lands of South and Central America, though commercial production has reached as far north as Florida and has also been adapted in some parts of Southeast Asia and Africa. The graviola tree yields around 4.8 tons of fruit per hectare four years after planting, rising to 11.8 tons after 10 years. The high demand for graviola or soursop fruit in many parts of North America is proving useful for introducing the commercialization of cherimoya, a closely-related species with a prized sweet flavor. Today, graviola is cultivated in many countries, including China, Australia, Vietnam, the Philippines, Malaysia, Cuba, India, Puerto Rico, the Bahamas, Venezuela, Argentina, West Africa, Mexico, and parts of Central America. However, few regions produce the annona fruit commercially: a short list includes Philippines, the Caribbean nations, and parts of South America. Graviola is often used as a flavoring ingredient in beverages.